13,000: Participants marched in the Inaugural Parade. 8,000: Members of America’s police departments provided security on Inauguration Day. 1,382: Applications received by the PIC, from groups requesting to march in the Inaugural Parade. Over 1,000: Neighborhood Ball Parties organized across the country. Over 90: Groups marched in the Inaugural Parade. 10: Jumbo screens on the National Mall broadcasted inaugural events. As a simple precaution, Obama took presidential oath again after he stumbled on the words of the presidential oath. 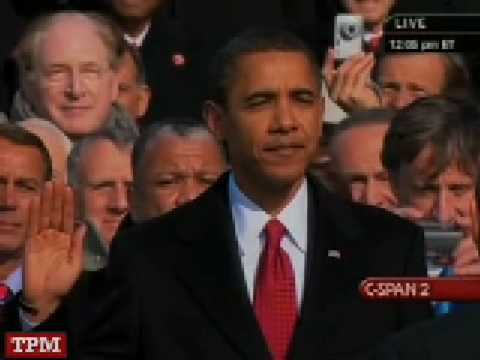 After the flub heard around the world, President Barack Obama has taken the oath of office. Again. Chief Justice John Roberts delivered the oath to Obama on Wednesday night at the White House — a rare do-over. The surprise moment came in response to Tuesday’s much-noticed stumble, when Roberts got the words of the oath a little off, which prompted Obama to do so, too. Don’t worry, the White House says: Obama has still been president since noon on Inauguration Day. “We decided that because it was so much fun …,” Obama joked to reporters who followed press secretary Robert Gibbs into the room. No TV camera crews or news photographers were allowed in. A few of Obama’s closest aides were there, along with a White House photographer. “Are you ready to take the oath?” he said. Roberts then led Obama through the oath without any missteps. The president said he did not have his Bible with him, but that the oath was binding anyway. Of course, the “coverage” of this Inauguration ceremony would not be complete without this video ! Placing his hand on the Bible once used by Lincoln, Barack Obama took the Oath of Office at 12:05 p.m. on the steps of the U.S. Capitol. Immediately following, he delivered his Inaugural Address to a sea of flag-waving Americans, which stretched down the National Mall to the Lincoln Memorial and beyond. The full text of his address is below.